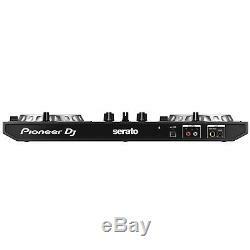 Pioneer DDJ-SB3 Serato DJ Controller + Party Box 8 LED Bluetooth Speakers Pack. 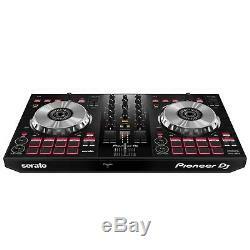 Pioneer DJ DDJ-SB3 2-channel DJ Controller for Serato DJ Lite. The new Pioneer DJ DDJ-SB3 DJ controller offers an intuitive interface for beginner DJs to craft professional performances and improve their skills. The DDJ-SB3 improves on the renowned DDJ-SB2, which gained a strong reputation with a wide range of DJs &###xE2;&###x20AC;&###x201C; from beginners to pros &###xE2;&###x20AC;&###x201C; thanks to its combination of professional features and easy portability. The interface of the DDJ-SB3 is even more intuitive to use than its predecessors, inheriting traits from the layouts of the top models in the DDJ-S series including the introduction of the dedicated play and cue buttons, and the independent Auto Loop button. 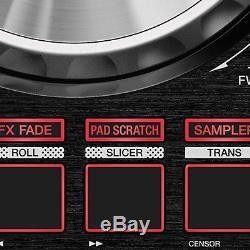 In collaboration with DJ Jazzy Jeff, Pioneer has created Pad Scratch. The brand-new feature on the DDJ-SB3 enables you to reproduce scratches based on the legendary hip hop DJ&###xE2;&###x20AC;&###x2122;s own recordings by simply pressing the Performance Pads. Plus, smooth mixing is a breeze thanks to another new feature, FX Fade. You can use these features to create a professional performance, even if it&###xE2;&###x20AC;&###x2122;s your first time behind the decks. 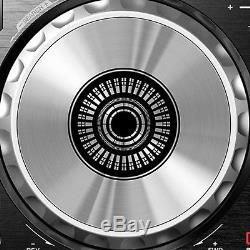 Pioneer DJ DDJ-SB3 DJ Controller Features at a Glance. Designed for Serato DJ Lite for intuitive DJ performances. New professional layout with dedicated Play/Cue buttons. 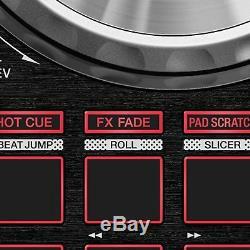 8 performance pads for Hot Cues, FX Fade, Pad Scratch, and Sampler features. World's first Pad Scratch techniques recorded by DJ Jazzy Jeff, for easy and unique scratch performances. FX Fade featuring 8 FX patterns to choose from for smooth mixing. Built-in sound card (audio interface), plug and play by simply connecting the controller to your laptop using a single USB cable. Class compliant, no need to install a driver. Microphone input circuit delivers clear audio without distortion, even with high input level. Grab handles on both sides makes it easy to carry. Paid upgrade to Serato DJ Pro (previously known as Serato DJ) for more professional DJ performances (available separately). Designed for use with Serato DJ Lite for intuitive DJ performances The layout design of the DDJ-SB3 is inherited from the top models in the DDJ-S series. 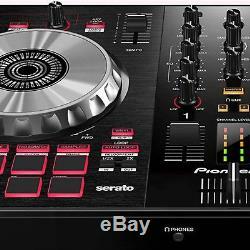 The jog wheels, Performance Pads, play and cue buttons, independent Auto Loop buttons and all the knobs and fader positions in the mixer section are arranged in a way that enables intuitive, professional DJ performances. World&###xE2;&###x20AC;&###x2122;s first Pad Scratch for easy, professional scratch performances By simply pressing the Performance Pads on the DDJ-SB3, you can use the Pad Scratch feature to imitate eight different scratch techniques recorded by DJ Jazzy Jeff. Any track that you&###xE2;&###x20AC;&###x2122;re playing or have cued up will be scratched, and the scratch speed automatically matches the track&###xE2;&###x20AC;&###x2122;s BPM. So even if you have no experience, you can create professional scratch performances without breaking rhythm. Use the feature in isolation or combine it with your own scratching on the other deck for limitless creative possibilities. FX FADE for smooth mixing Using the new FX Fade feature, you can reduce the volume and apply FX to a track at the same time. Whether you&###xE2;&###x20AC;&###x2122;re an experienced DJ or a beginner, this enables you to smoothly transition to your incoming track, even if you&###xE2;&###x20AC;&###x2122;re playing with different genres of music. There are eight FX patterns to choose from, with two of each of the following types: high pass filter, low pass filter, loop playback and back spin. Visual design enables intuitive performances The DDJ-SB3 feels natural to use thanks to the clear visual division of the player and mixer sections, which feature a hairline and glossy finish respectively. The aluminum jog wheels create a quality look and feel. 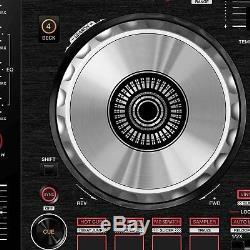 Durable Design The DDJ-SB3 is constructed from premium materials and audio circuitry. Its robust build ensures durability, while the distinctive styling and aluminium jog wheel deliver a professional feel. Large jog wheels It may be compact, but the DDJ-SB3 features large, low-latency jog wheels to give you great scratch response and accuracy. Portable design Take this controller with you wherever you go thanks to the easy grab handles and lightweight design. Simply connect the USB cable to begin playing. On-board Serato sound card Simply connect to your PC/Mac via USB to get plug-and-play control of Serato DJ Lite, no need for an external sound card. Simply connect your PC/Mac and start playing. Clear audio The mic input circuit produces clear audio without distortion to ensure crystal-clear sound even at high input levels. American Audio Party Box 8 8 Two-way Active Speaker with Built-in Light Show and Bluetooth. The American Audio Party Box 8 is a compact powered speaker with a built-in lightshow that can provide a fun and exciting atmosphere for house parties, backyard BBQs, and school dorms. Instantly create a party with your favorite music and the built-in LED red, green and blue lights with the Party Box 8 portable DJ speaker system. The speaker comes in a durable plastic housing with carry handles and a pole mount (for speaker stand mounting). Users have many options when it comes to playing music. They can play music wirelessly from a computer or mobile device through the speaker&###xE2;&###x20AC;&###x2122;s wireless audio capabilities. Two speaker may almost be paired through stereo linking. There are also line inputs on the back of the speaker. Users can plug in a mini plug and play music from a MP3 player or use the XLR or RCA inputs for a DJ or PA mixer. There is also a microphone input with XLR connections. Users can control the master volume, bass and treble, as well as, the microphone and line in volumes from the back of the speaker. There is a master On/Off switch and a LED On/Off/Color Selection button as well. The Party Box 8 is powered by a 30W class D power amplifier with an 8-inch woofer and 1-inch tweeter. An IEC power cable is included inside the box. ProX 10FT RCA to XLR-M Unbalanced High Performance Audio Cable [XC-RXM10]. Prox cables provides audiophiles with amazing sound cables. We know cables are not just cables, they are what protects your sound from being altered. ProX XC-RXM10 is ideal for professional touring and live sound applications where a device with a dual 1/4" output/input needs to be connected to a device with a dual 1/4" output/input. 93% braided OFC Copper Compact shield to reduce noise and protect pure sound transfer. Compact cable diameter to decrease eddy currents. Bending and twisting, are no match for ProX high performance tour-grade audio cables. They're designed to provide years of dependable sound reproduction and outlast every other cable on the market! Complete Coil technology demands consistent weave tolerances to create precise accuracy and detailed clarity. This is the most important part of the design and greatly affects performance. Numark HF125 Professional DJ Headphones. One place a DJ can&###x2019;t compromise is in how they hear their mix. The Numark HF-125 headphone set delivers the goods with flexible 7-position independently adjustable dual ear cups, large 40mm Mylar speaker drivers, 6&###x2019; tangle-resistant cord with a molded 1/8&###x201D; TRS connector and a 1/8&###x201D; to &###xBC;&###x201D; TRS adapter, and padded headband and ear cups. Gemini DJ ST-Pack Dual Speaker Stands with Carrying Case. (2) Speaker stands with carrying case, stands extend to 6' 2. Gemini DJ ST-Pack Dual Speaker Stands with Carrying Case Features. Works with internal or external speaker mounts. Hand adjustable bold tightens shaft in any location from 43&###x201D; (1.1m) to 80&###x201D; (2m). Locking safety pin adds another layer of security, keeping your speaker securely in place. 120-degree tripod leg design spreading from 32&###x201D; (81cm) to 48&###x201D; (122cm), expanding up to twice the width of the speaker cabinet. Holds up to 200lb (90kg). 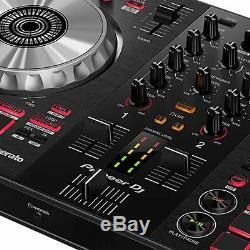 This Package Includes: (1) Pioneer DJ DDJ-SB3 2-channel DJ Controller for Serato DJ Lite (2) American Audio Party Box 8 8 Two-way Active Speakers with Built-in Light Shows and Bluetooth (2) ProX 10FT RCA to XLR-M Unbalanced High Performance Audio Cables [XC-RXM10] (1) Numark HF125 Professional DJ Headphones (2) Gemini DJ ST-Pack Dual Speaker Stands with Carrying Case The DDJ-SB3 Retail Box Includes: (1) Pioneer DJ DDJ-SB3 2-channel DJ Controller for Serato DJ Lite (1) USB Cable (1) Set of Operating Instructions (Quick Start Guide). Each American Audio Party Box 8 Retail Box Includes: (1) American Audio Party Box 8 8 Two-way Active Speaker with Built-in Light Show and Wireless Audio Connectivity (1) IEC Power Cable. Each Retail Box Includes: (1) ProX 10FT RCA to XLR-M Unbalanced High Performance Audio Cable [XC-RXM10]. The Numark HF125 Box Includes. (1) Numark HF125 Headphones (1) 1/8" to 1/4" TRS adapter. 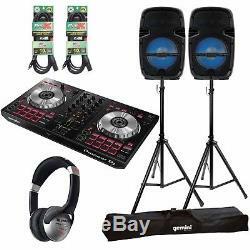 (2) Gemini DJ speaker stands (1) Gemini dual speaker stand carrying case. 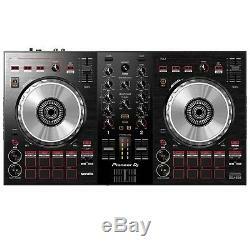 Pioneer DJ DDJ-SB3 2-channel DJ Controller Specifications. 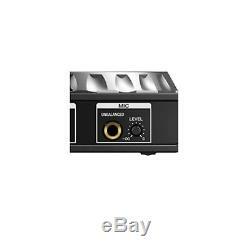 Software: Serato DJ Lite (previously known as Serato DJ Intro) Frequency Response: 20 Hz to 20 kHz Total Harmonic Distortion: 0.005 % S/N Ratio: 103 dB (USB) Input / Output Terminals: Inputs: MIC x 1 (1/4 inch TS jack) Outputs: MASTER x 1 (RCA x 1) PHONES x 1 (3.5 mm stereo mini jack x 1) USB: USB (Type B) x 1 Power Supply: USB bus power (DC 5V) Power Consumption: 500 mA Maximum Dimensions (WxDxH): 482.6 x 272.4 x 58.5 mm / 19" x 10.7" x 2.3 Weight: 2.1 kg / 4.63 lbs. Accessories: USB cable Quick Start Guide System requirements: Compatible OS: Mac - macOS High Sierra 10.13 (Updated to the latest version) macOS Sierra 10.12 (Updated to the latest version) OS X 10.11 (Updated to the latest version) Windows - Windows 10, 8.1, 7 (The latest service pack) 32-bit, 64-bit CPU Intel processor CoreTM i7, i5, i3: 1.07 GHz or above Memory 4 GB or more of RAM Serato DJ Lite, Serato DJ Intro, Serato DJ Pro and Serato DJ are registered trademarks of Serato Limited. Mac, OS X or macOS are trademarks of Apple Inc. Registered in the US and other countries. Intel and Intel Core are registered trademarks of Intel Corporation in the US and other countries. The names of companies, product names and technology names mentioned herein are the trademarks of their respective owners. American Audio Party Box 8 Specifications. Two Retail Locations &###x2022; One Massive Warehouse &###x2022; Thousands of Items in Stock &###x2022; Fast Free U. &###xA9; 2017 I DJ NOW. Any use of this material including all content, images and design, without prior written consent from IDJNOW, is strictly prohibited by law. This listing is currently undergoing maintenance, we apologise for any inconvenience caused. 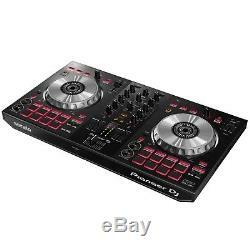 The item "Pioneer DDJ-SB3 Serato DJ Controller + Party Box 8 LED Bluetooth Speakers Pack" is in sale since Tuesday, May 29, 2018.